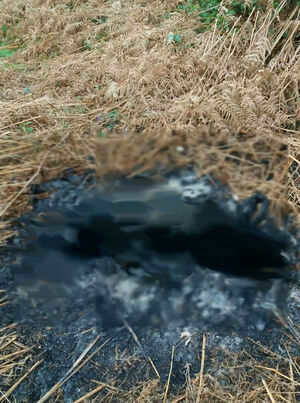 Cork Animal Care Society appealed for information about a dog which was found burned in The Glen area of Cork city this week. Last week we got word of a Lurcher straying. One of our staff, a few good people and the city dog warden went to try get him over a few days but he remained elusive, then disappeared! What kind of sick twisted individual/individuals would do this to an animal? Was the dog still alive when it was burnt to death? The person who found its body believes it was. Over the last few days the amount of cruelty we have heard of and been witness to here in Cork is unbelievable! People who hurt animals are PSYCHOPATHS and if they hurt an animal of course they will hurt a fellow human! Whoever did this to this poor dog, you will get your comeuppance! If anyone has ANY INFORMATION about this dog please contact us, we promise it will be done confidentially! All the relevant authorities will be informed. Please do not let this dog’s life be in vain, if anyone knows anything about it, get in touch! Thank you to the kind person who sent us the photos and is understandably very upset by it all! We will update when or if we have any further information! Heartbroken for this poor cratur. Squee: French Bulldog Pup Versus Doorstop S’Up Dawg? Best Hot Sauce Ad Ever Wanna Treat, Boy? Posted in Misc and tagged burned, Cork Animal Care Society, dog at 11:10 am on January 17, 2019 by Bodger. now tell me which is the correct statement?? Horrendous. People really are awful. I’m awful too as I’m offended by the overuse of exclamation marks in that piece. ‘Hot-dog Stand’ would have been a better caption. well it appears to be good at smoking out the psychopathic commenters here.. Please don’t post pictures like that. Without a warning. It’s not helping. Do people really need a ‘warning’ for every possible picture they may find upsetting or distasteful? It’s part of life, as unpalatable as that may be. You are all adults presumably? I think most adults would have an understanding of why a picture like this would be upsetting and appreciate the effect of a warning, even if they do not require one themselves. It’s actually not difficult to understand and does not violate any weird unwritten rules of adulthood. Since adulthood is usually associated with maturity, quite the opposite. Yes Nigel. I am aware and understand it may be upsetting, it’s not a nice picture. However I don’t think it’s practical or even desirable that people are insulated from things that might upset them. Your smartarse tone and insatiable need to step in and speak for others is weird. @dav I don’t think burning dogs or drowning puppies in rivers is acceptable, or even normal but I know it happens. I don’t like that it happens either. It’s nothing to do with insulating people, it;s to do with giving them some idea of what to expect. Life may throw shocks at us, but life can be random and cruel, that doesn’t mean we are required to emulate it in our dealings with each other, in fact all the more reasons to show consideration. Your insistence that I’m speaking for anyone but myself is weirder. Nigel you’re infringing on Andrew’s right to be a hard man adult who can fupping take it, ok? I honestly think if he thought about it he might see that a warning of some kind is not akin to overprotective parenting or whatever. It’s just kindness. What life do you live where the burning alive of docs is normal? bit of an expert on the subject are we? ?